You’re in Chicago and your family is hungry. Well, you’ve come to the right place! No other city boasts such a rich and diverse culinary scene. But the trick is finding great food that everyone in your family will enjoy and won’t break the bank. Carol Stream and Glen Ellyn pizza lovers can't get enough of our product so if you haven't experienced the joy of our food, check us out! And don't forget to try our award winning Chicago wings! Your family won't find a better deal with this type of quality. And when you spend $25 or more, you'll receive FREE cheesy garlic bread. Yes, free. Check out all our Chicago pizza and wings promotions here. 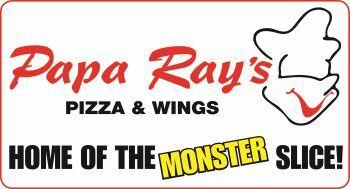 Want more information or need help planning your trip to Papa Ray's Pizza and Wings? Connect with us on Facebook!